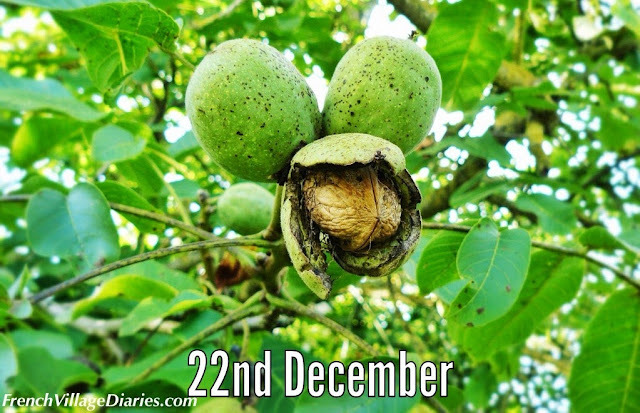 It’s the 22nd December and W is for Walnuts. I love everything about walnuts; from the size and shape of the two old trees we have in our orchard, to the smell of their leaves and of course their delicious taste and versatility in the kitchen. Even the raking of the damp leaves on a chilly winters day is good exercise for the body and the mind too, when the air is heavy with their fragrance. Walnuts are reported to be a super food with one portion of nuts (about 14 halves) providing your daily dose of omega-3 fatty acids that may help to lower blood pressure and prevent cardiovascular disease. The Dordogne region is famous for it’s walnut (noix) production and I can still remember the taste of a delicious walnut crème brulée in Argentat-sur-Dordogne, when on one of our road trips that also saw us following the Route des Noix and the Dordogne River. Some of my favourite things to make and bake with our walnuts are pesto, bread, coffee and walnut cake, Christmas mincemeat and we even add them to our terrine de porc. There are also some lovely recipes in Walnut Wine and Truffle Groves: Culinary Adventures in the Dordogne by Kimberley Lovato, a beautiful book that is so much more than just a cookbook. Don’t forget to pop back tomorrow for the letter X. If you have missed my previous advent posts you can catch up by clicking on the letters A, B, C, D, E, F, G, H, I, J, K, L, M, N, O, P, Q, R, S, T, U and V.